A shoemaker from Maybole was stuck in the eye by a golf club. 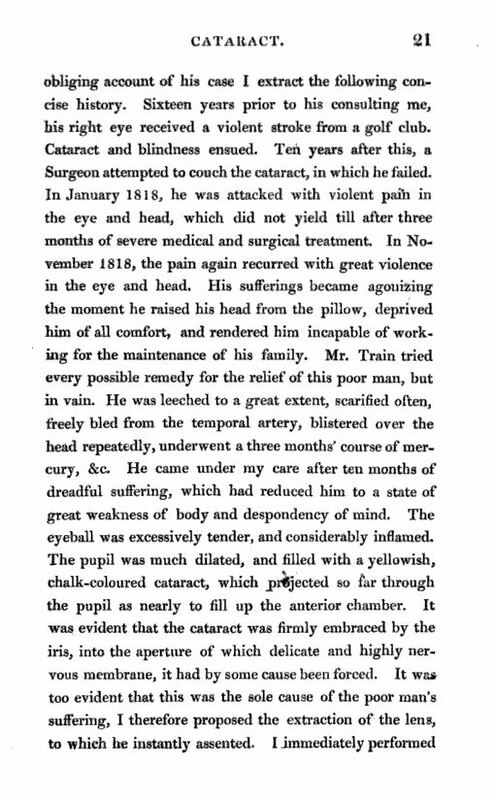 Here is the story of the painful state of eye surgery in 1819. 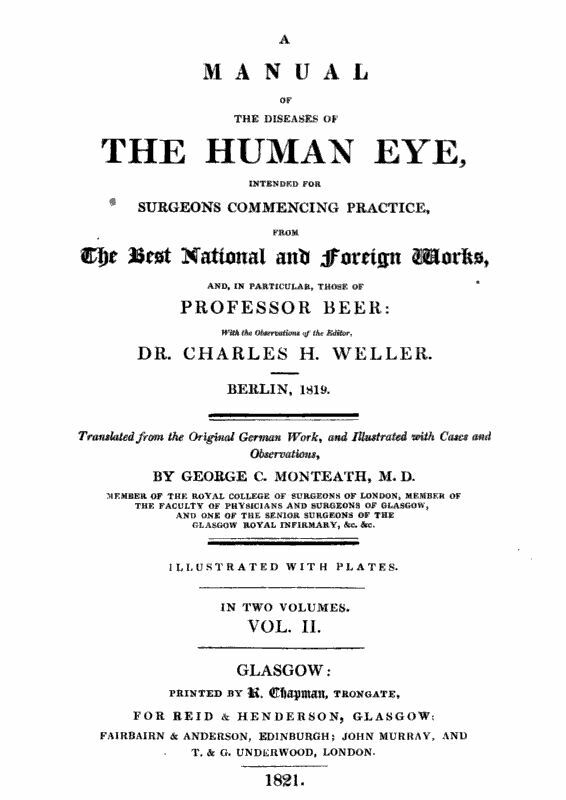 The account below is an excerpt from a book titled A Manual of the Diseases of the Human Eye intended for Surgeons commencing practice. Berlin 1819. Translated from the original German Work by George C. Monteath, M. D. The original pages of the book are on the right. Click to view full size. The following case of Bony Cataract may be worthy of being recorded. In September 1819, I was consulted by Gilbert M'Crindle, a shoemaker from Maybole, by the desire of Mr. Train, his medical attendant, from whose obliging account of his case I extract the following concise history. Sixteen years prior to his consulting me, his right eye received a violent stroke from a golf club. Cataract and blindness ensued. 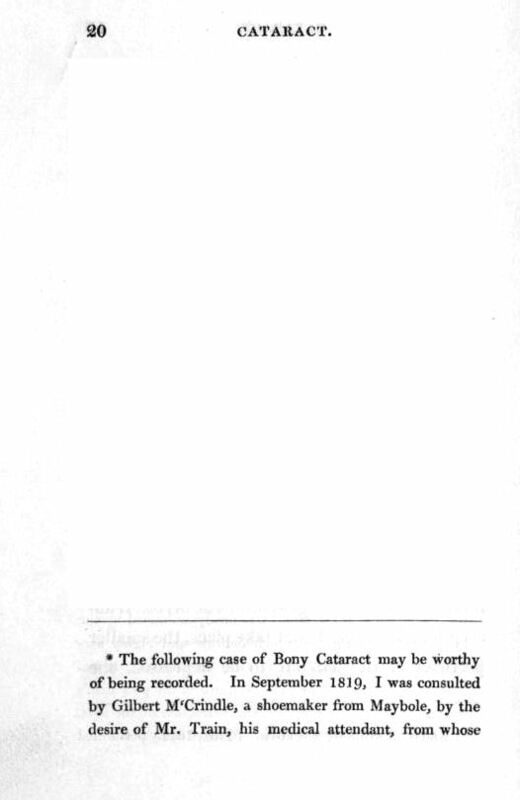 Ten years after this, a Surgeon attempted to couch the cataract, in which he failed. In January 1818, he was attacked with violent pain in the eye and head, which did not yield till after three months of severe medical and surgical treatment. In November 1818, the pain again recurred with great violence in the eye and head. His sufferings became agonizing the moment he raised his head from the pillow, deprived him of all comfort, and rendered him incapable of working for the maintenance of his family. Mr. Train tried every possible remedy for the relief of this poor man, but in vain. He was leeched to a great extent, scarified often, freely bled from the temporal artery, blistered over the head repeatedly, underwent a three months' course of mercury, &c.
He came under my care after ten months of dreadful suffering, which had reduced him to a state of great weakness of body and despondency of mind. The eyeball was excessively tender, and considerably inflamed. The pupil was much dilated, and filled with a yellowish, chalk-coloured cataract, which projected so far through the pupil as nearly to fill up the anterior chamber. It was evident that the cataract was firmly embraced by the iris, into the aperture of which delicate and highly nervous membrance, it had by some cause been forced. It was too evident that this was the sole cause of the poor man's suffering, I therefore proposed the extraction of the lens, to which he instantly assented. I immediately performed the operation. After making the incision of the cornea as large as the state of the anterior chamber would admit of, I attempted to press out the cataract in the usual manner. Finding this impracticable, I extracted it by means of the cataract hook. On removing it, I was surprised to find it a perfect shell of bone, of the size and shape of the lens, complete on all sides, except at the centre of its posterior surface, where the arteria centralis enters the posterior capsule in its natural state. Whether I made this hole with the hook I cannot say. The eye was dressed as usual. The patient felt instantly relieved from all his sufferings, for which his expressions of joy and thanks were unbounded. In a few days the wound of the cornea had adhered, and soon after healed. On examining the eye, when free from all tenderness, I was surprised to find the pupil, which had been for ten months unceasingly distended to the utmost, to have resumed its natural form and size. 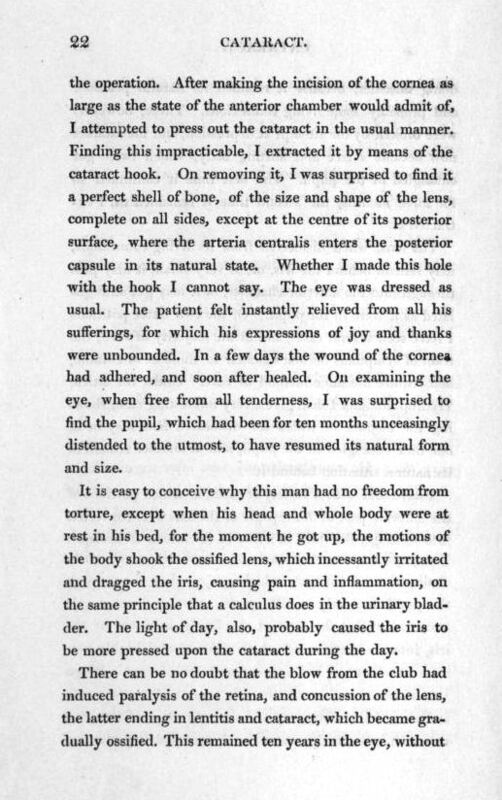 It is easy to conceive why this man had no freedom from torture, except when his head and whole body were at rest in his bed, for the moment he got up, the motions of the body shook the ossified lens, which incessantly irritated and dragged the iris, causing pain and inflammation, on the same principle that a calculus does in the urinary bladder. The light of day, also, probably caused the iris to be more pressed upon the cataract during the day. There can be no doubt that the blow from the club had induced paralysis of the retina, and concussion of the lens, the latter ending in lentitis and cataract, which became gradually ossified. This remained ten years in the eye, without doing mischief; because it retained its natural position, and probably some living connexions. These, however, were broken by the attempt at depression, and the cataract now became a free and floating body, which twice got entangled in the pupil. The first time it continued so for three months, the second time it remained till I extracted it. The lens, when dislocated from its living connexions, may remain behind the iris, or, if very small, it may pass through into the anterior chamber, or it may get strangulated as it were in the pupil. Of the two latter positions I have seen several cases, and in the majority of such, the train of symptoms becomes similar to those of M'Crindle, and require the same method of cure. 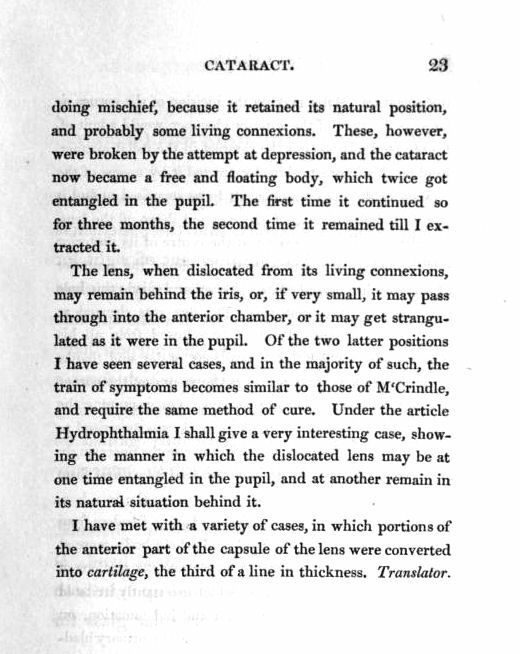 Under the article Hydrophthalmia I shall give a very interesting case, showing the manner in which the dislocated lens may be at one time entangled in the pupil, and at another remain in its natural situation behind it.